It's important to keep your Leeds home watertight and, because a roof doesn’t end with the condition of the tiles; gutters, fascias, soffits and barge boards play a vital role in keeping the roofline intact and your Leeds home weatherproofed. Initial problems with the roofline often lead to greater expense further down the line, as the beams and joists of your roof are susceptible to damp. We can address the problem right away. Call us on Leeds 0113 370 9095. Also, nesting birds can cause plastic guttering to misalign. We've even had customers who have cracked their gutters by resting a ladder against them! Fascias and soffits perform a vital role in sealing the roof to the house, but if they are badly fitted or have become rotten over time, they will need replacement if you are to keep the maintenance costs down for your home in Leeds. We can help you deal with this problem today. Get in touch and we’ll give you an honest view on what you need, with no upfront cost or obligation. 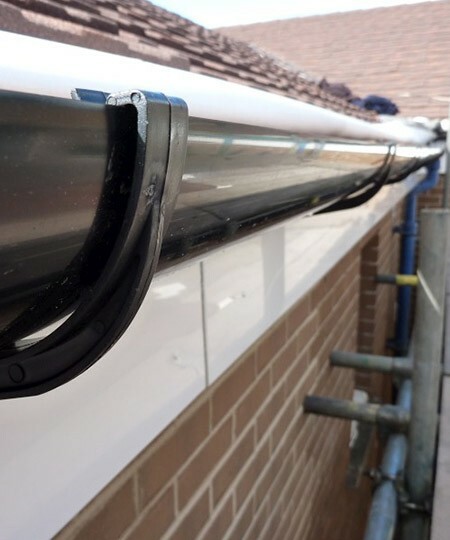 To learn more about our guttering services, call today on Leeds 0113 370 9095.